Hotel Berlin, Berlin is Partner of the World Orchestra of Jeunesses Musicales. 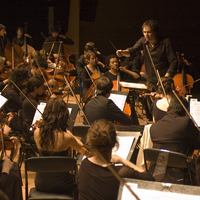 The World Orchestra of Jeunesse Musicales will give a concert conducted by Josep Vincent at the Berlin Philharmonic on the 15th of January 2008. The Hotel Berlin, Berlin supports the oldest international Youth Orchestra and will host the young musicians during their stay in the German capital. The repertoire chosen for this tour includes works by Ravel, De Falla, Adams and Leonard Bernstein who conducted the World Orchstra in the 70's. The choice of the Hotel Berlin, Berlin is a deliberate one: the hotel combines tradition with modern settings and saw a complete refurbishment of it's over 700 rooms. The location in the heart of the city and the surpassing interior provide an enjoyable atmosphere. „This orchestra of young musicians is something more: it is a wonderful world community" as Leonard Bernstein put it, applies also to the Hotel Berlin, Berlin: It is more than a hotel. It is a place where people meet. We are looking forward to meet these young international artists. Treat yourself to our outstanding service and experience the renascence of a great hotel! Please scroll down for the GERMAN, FRENCH and SPANISH version. Anna Politkovskaya received the 2003 first prize for “Tchétchénie, le déshonneur russe:” a courageous, unblinkered and uncomfortable examination of the Russian-Chechnyan conflict; her international reputation didn’t protect her from being murdered in Moscow in October 2006. Other winners of the first prize were Alexandra Fuller (2005) and Linda Grant (2006). Other prize winners and finalist include: Nuruddin Farah, Abdellah Hammoudi, Ian Buruma, Jean Hatzfeld, Paulo Moura, Linda Polman, Suketu Mehta, Riverbend (Pseudonym), Erik Orsenna, Juanita León, Mark Tully, Li Datong, Carolin Emcke and William Langewiesche. Der Lettre Ulysses Award für die Kunst der Reportage wird im Jahr 2007 nicht verliehen werden. Dieser einzige Weltpreis für Reportageliteratur wurde 2003 von der Zeitschrift Lettre International mit finanzieller Unterstützung der Aventis Foundation ins Leben gerufen und bis 2006 jährlich vergeben. Von Beginn an war das Goethe-Institut Partner des Projekts. Nachdem der Vertrag mit der Aventis Foundation ausgelaufen ist, ist es der Stiftung Lettre International Award bisher nicht gelungen, einen neuen Partner zur Finanzierung zu finden. Die Veranstalter hoffen, den Preis ab 2008 wieder jährlich vergeben zu können. Seit seiner Gründung hat der Preis bei Journalisten und Schriftstellern, bei Verlegern und in der politischen Öffentlichkeit weltweit erhebliche Resonanz gefunden. So traf die deutsche Kanzlerin Angela Merkel auf ihrer Chinareise 2006 die chinesischen Autoren Chen Guidi und Wu Chuntao, die für ihr Buch „Zur Lage der chinesischen Bauern“ 2004 mit dem ersten Preis des Lettre Ulysses Awards ausgezeichnet wurden. Anna Politkovskaja erhielt 2003 den ersten Preis für ihr Buch „Tchétchénie, le déshonneur russe“, eine mutige, illusionslose und unbequeme Betrachtung des russisch-tschetschenischen Konflikts; ihr internationales Ansehen schützte sie nicht davor, im Oktober 2006 in Moskau ermordet zu werden. Gewinner des ersten Preises waren auch Alexandra Fuller (2005) und Linda Grant (2006). Zu den weiteren Preisträgern und Finalisten zählten u.a. Nuruddin Farah, Abdellah Hammoudi, Ian Buruma, Jean Hatzfeld, Paulo Moura, Linda Polman, Suketu Mehta, Riverbend (Pseudonym), Erik Orsenna, Juanita León, Mark Tully, Li Datong, Carolin Emcke und William Langewiesche. Le prix international Lettre Ulysses Award for the Art of Reportage ne sera pas attribué en 2007. Seul prix international qui récompense à l’échelle mondiale des ouvrages et textes appartenant au genre du reportage littéraire, le prix Lettre Ulysses Award for the Art of Reportage a été crée en 2003 par la revue culturelle Lettre International, Berlin, avec le soutien financier de Aventis Foundation et en partenariat avec le Goethe Institut. Le contrat qui liait la Fondation Lettre International Award, gestionnaire du prix, à Aventis Foundation ayant pris fin, il fallait trouver les financements nécessaires pour prendre la relève. Ceux-ci n’ont pu être réunis à ce jour. Les organisateurs ont néanmoins bon espoir d’y parvenir et de revenir à un rythme annuel d’attribution du prix en 2008. Dès sa création, le prix Lettre Ulysses Award a suscité un grand intérêt dans le monde des lettres, de la presse et de l’édition et attiré l’attention jusque dans les sphères du monde politique. C’est ainsi que, lors de son voyage en Chine en 2006, la chancelière Angela Merkel avait demandé à rencontrer les auteurs chinois Chen Guidi et Wu Chuntao, lauréats du prix 2004 pour leur ouvrage sur la situation des paysans chinois. C’est Anna Politkovskaïa qui avait reçu le premier prix en 2003 pour son ouvrage dérangeant, courageux, sans concession ni illusion sur le conflit russo-tchètchène : « Tchétchénie, le déshonneur russe ». La renommée internationale que lui valut ce livre ne suffit pas, toutefois, à la protéger. Elle fut assassinée à Moscou en octobre 2006. Au nombre des lauréats appartiennent également Alexandra Fuller (1er prix 2005) et Linda Grant (1er prix 2006). Parmi les personnalités primées ou nominées figurent encore des auteurs comme Nuruddin Farah, Abdellah Hammoudi, Ian Buruma, Jean Hatzfeld, Paulo Moura, Linda Polman, Suketu Mehta, Riverbend (pseudonyme), Erik Orsenna, Juanita Le, Mark Tully, Li Datong, Carolin Emcke ou William Langewiesche. El premio Lettre Ulysses Award no será otorgado en 2007. El único premio a nivel mundial que se concede para el arte del reportaje fue creado en 2003 por la revista Lettre International con el apoyo financiero de la Aventis Foundation y conferido anualmente hasta el 2006. Finalizado el término del contrato con la Aventis Foundation, no ha sido fácil para la Fundación Lettre International encontrar un socio financiero. Este proyecto que desde sus inicios ha tenido como socio al Instituto Goethe, espera poder seguir otorgando este premio de nuevo a partir de 2008, afirman sus organizadores. Desde su creación, el premio Lettre Ulysses Award ha tenido muy buena acogida y resonancia a nivel mundial por parte de periodistas, escritores y editores, y por miembros del sector político. Es así, como la Canciller alemana Angela Merkel en su viaje a China en 2006 se encontró con los autores Chen Guidi y Wu Chuntao, quienes obtuvieron el primer puesto del premio Lettre Ulysses Award en el 2004 con su libro: „La situación de los campesinos chinos“. Anna Politkovskaja obtuvo el primer lugar del premio en 2003 por su libro „Tchétchénie, le déshonneur russe”, una posición valiente, desilusionante e incómoda sobre el conflicto ruso-checheno. Su mirada internacional del conflicto no la salvoguardó de su asesinato en octubre de 2006. Merecedores del primer puesto fueron también: Alexandra Fuller (2005) y Linda Grant (2006). Entre otros ganadores y finalistas se pueden mencionar a: Nuruddin Farah, Abdellah Hammoudi, Ian Buruma, Jean Hatzfeld, Paulo Moura, Linda Polman, Suketu Mehta, Riverbend (seudónimo), Eric Orsenna, Juanita León, Mark Tully, Li Datong, Carolin Emcke y William Langewiesche. The international jury of the Lettre Ulysses Award, the only world prize for literary reportage, announced this year’s winner on September 30thth in Berlin’s TIPI Tent, in the presence of all seven finalists, the international jury of prestigious reportage writers and more than 500 international guests from the worlds of art and culture, media, politics and diplomacy. LINDA GRANT, Great Britain: The People on the Street. A Writer’s View of Israel, Virago Press, London, 2006. The British journalist and writer Linda Grant, a non-religious Diaspora Jew, travels to Tel Aviv in 2003. Her visit becomes an opportunity for a systematic and in-depth exploration of Jewish identity and its relationship with the state of Israel. Her book is a journey through an extraordinary and problematic society, through the languages and biographies of its inhabitants, their archetypes and histories, their doubts and their hopes. Observations from a troubled land that is determined to defend its existence and that is ensnared in a conflict that seems to promise tragic consequences rather than peaceful prospects. ERIK ORSENNA, France: Voyage aux pays du coton. Petit précis de mondialisation, Fayard, Paris, 2006 [Journey to the Lands of Cotton. A Brief Manual of Globalisation]. On his journey through the lands of cotton, the French writer Erik Orsenna visited plantations in Mali and the United States, research laboratories and farms in Brazil and museums in Egypt, dried out lakes and steeps in Uzbekistan, textile factories in China and France are all places of encounter with the raw material which has marked the history of entire countries and which to this day hundreds of millions of people still depend upon for their livelihoods. The book brings the mechanisms of globalisation to life, the fight for market shares, the struggle for new products, the conflict between history and modernisation, between multinational companies and more traditional economies, the rhetoric of open markets and the global practice of lobbying. JUANITA LEÓN, Colombia: País de plomo. Crónicas de guerra, Aguilar, 2005 [Country of Bullets. War Diaries]. Since 1948 Columbia has been torn apart by violence and civil war. A guerrilla movement of “liberals”, and the peasant self defence committees, supported by the Communist Party, formed in opposition to the conservative oligarchy and the military leadership. Then later the drug cartels and paramilitaries appeared on the scene. In her book, the Columbian journalist Juanita León describes the important aspects of the drama: The suffering of the rural population, the ravages of the death squads, the incompetence of the government, the role of the drug economy and the increasing loss of humanity. Observations and encounters in a war with many fronts. The other finalists received prizes in the form of a working residencies in Berlin (endowed by the Goethe-Institut) and valuable handmade watches by the company Nomos. LI DATONG, China: ‘Bingdian’ Gushi, Guangxi Shifan Daxue Chubanshe, 2005 [The Story of “Freezing Point”, Guangxi Normal University Press]. In January 2006 news of the closure of the magazine “Freezing Point” Weekly shook China’s political and cultural media. With this move the Chinese government killed off a beacon of hope for freedom of opinion. “Freezing Point” was the weekly supplement of the Communist Youth League organ and was edited by the journalist Li Datong. He had been banned from working for five years following the Tiananmen Square massacre but in 1995, during a period of commercialisation and liberalisation, he became the editor of this publication. Brave and humane reportages revealed an image of a society in which lawlessness, corruption, exploitation and the propaganda of state-controlled mass media set the tone. As it increasingly became the most popular publication in China, “Freezing Point” was also becoming more and more inconvenient. Li Datong tells the story of the conflict, of the rise and fall of the magazine. MANJUSHREE THAPA, Nepal: Forget Kathmandu: An Elegy for Democracy, Penguin Viking India, New Delhi, 2005. The murder of the Nepalese king in the royal palace massacre of 2001 shook the legitimacy of the ruling dynasty. Parliamentary democracy was replaced, and democratic rights and freedoms were suspended. The poverty of the rural population gave rise to Maoist guerrillas, who today control entire regions of the country. Manjushree Thapa’s reportage leads the reader through the Byzantine power structures and to the remote western mountainous region of this Himalayan country, where many villagers and rural people have fled the epidemic violence. The patriarchal oppression of women in the society and family is one reason why so many of the guerrillas are young women. Amidst all this destruction the author sees the growth of a democratic consciousness. ZHOU QING, China: Min Yihe Shi Wei Tian. Zhongguo Shipin Anquan Xianzhuang Diaocha, Bangao Wenxue, 9/2004 [“What Kind of God. A Survey of the Current Safety of China’s Food”, in: Reportage Literature 9/2004]. The wealth of its cuisine attests to just how much China’s four-thousand-year history is linked to the history of its food. In today’s country of the “Chinese Economic Myth,” with its growth rates, skyscrapers, and global market success, the theme of foodstuffs is once against of extreme importance. In the realm of food and drink the desire for quick wealth can also lead to a lack of moral scruples. Zhou Qing interviewed food manufacturers and restaurant owners, fish farmers, peasants, traders, doctors, and consumers. Contraceptive pills accelerate fish farming, the pesticide DDVP keeps pickles from going off, hormones are used to replace foodstuffs, salt is chemically enhanced, industrial oil is altered to make cooking oil. An entire people are poisoning themselves. Excerpts from the nominated texts are published in German in the current issue of Lettre International, Nr. 74. The winners were announced on Saturday 30th September in Berlin at an award ceremony with 500 international guests from literature, art, culture, media, politics and diplomacy. The South African writer Breyten Breytenbach and the speaker of the jury Isabel Hilton were the evening’s presenters. The annual Lettre Ulysses Award was initiated in 2003 by the cultural journal Lettre International in association with the Aventis Foundation. The Goethe-Institut is a partner of the project. In 2006 the prize has a total endowment of 100,000 USD, as well as working residencies in Berlin and other prizes. The aim of the award is to bring the outstanding achievements of literary reportage and the themes of the nominated books to the focus of international attention and to support its authors both morally, materially and symbolically. The members of the 2006 jury, as native speakers, represent ten of the world’s largest language regions, the working language of the jury was English. The composition of the jury guarantees the widest range of linguistic and cultural perception. The members of the 2006 jury were: Gamal al-Ghitany (Egypt), Andrei Bitov (Russia), Urvashi Butalia (India), Nedim Gürsel, (Turkey), Isabel Hilton (Great Britain), Anne Nivat (France), Sergio Ramírez (Nicaragua), Pedro Rosa Mendes (Portugal), Ilija Trojanow (Germany), Yang Lian (China). A detailed Press Folder for the Lettre Ulysses Award 2006 can be downloaded here.